Due to the growing marketplace, its a common necessity for commercial goods and products to be moved to a new city or state. This need creates a great opportunity for new transportation businesses and as a result the trucking industry is an extremely competitive field. Because the competition is steep, save yourself time, money, and energy by thoroughly researching the industry before you jump in. If yo-re considering opening a trucking business, use this guide to help you get started. Determine how your trucking business will operate. Sub-contracted drivers: Under the first option, you run your business using sub-contractors as drivers. Although you, as the business owner, run the business and receive the contracts, your drivers are not actually employed by your company. This option cuts down on start-up costs, insurance costs, and required equipment. On the other side, this option gives you less control over your drivers and cuts into your profits. Privately-owned drivers: Under the second option, you privately run your business and all operations. You use your own equipment, pay higher insurance prices, and hire a fleet of private drivers as employees. This option gives you total control over your business and its employees, and promises the most return on profits. On the downside, this option requires a great deal more start-up capital and operating costs. Follow the traditional steps to starting a business. As with any new business venture, first understand the basics of starting a business, and then research the additional steps specific to your field. After yo've determined what type of trucking business yo'd like to start, follow these 10 Steps to Starting a Business for more information on financing your business, hiring employees, and complying with tax obligations. Comply with all trucking-specific business licenses, permits, and forms. Federal DOT Number and Motor Carrier Authority Number' Understand your requirements and apply for these certifications online at the Federal Motor Carrier Authorit's website. Heavy Use Tax Form (2290)' Comply with tax regulations related to the heavy use of U.S roads with IRS Form 2290.
International Registration Plan (IRP) Tag' Understand your requirements and obtain IRP tags by visiting your stat's transportation website and their IRP portal. International Fuel Tax Agreement (IFTA) Decal' Understand your requirements and obtain IFTA decals by visiting your state's transportation website. BOC-3 Filing - Use a processing agent and the BOC-3 filing option to secure and maintain active operating status. In addition to these operational requirements, if you chose to employ private drivers, they'll need to obtain special drivers permits or endorsements, such as a commercial driver's license, to legally operate your vehicles. Each state has a portal dedicated to commercial transportation. For example, Idaho's government website has a Trucking Portal that has detailed information on commercial driver's license requirements, rules and manuals, safety information, licenses and permits, taxes, and all other related issues. Before you start your trucking business, be sure to visit your state's transportation portal to help understand the required regulations and assistance your state provides. For more information on the regulations facing the trucking industry, visit Business.gov'sTransportation and Logistics guide. Because these regulations can be confusing, you may decide to hire a compliance professional to help make sure all requirements are met. Obtain the necessary insurance requirements to sustain your business. The nature of the trucking industry imposes strict insurance requirements on businesses. Because you own and oversee the operation of commercial vehicles, your insurance requirements will cost more than many other businesses. To fully understand your insurance responsibilities, discuss them with specialist in your area. In addition to your insurance responsibilities, your employer responsibilities require you to comply with health and safety standards and regulations. The U.S. Department of Labor's Occupational Safety and Health Administration provides compliance assistancefor the trucking industry to meet these expectations. Find and buy the proper equipment to get started. If you choose to operate a private fleet with your own drivers, you'll need to purchase commercial vehicle(s). Depending on your start-up capital, you'll need to determine how many vehicles are reasonable. 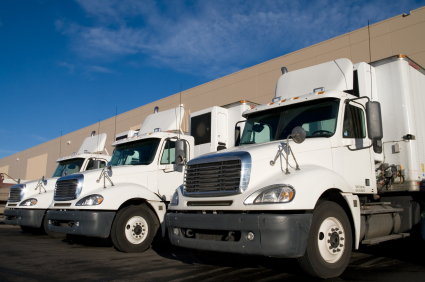 While many businesses start small, as your profits grow you can always add to your fleet. When choosing what commercial vehicles are appropriate, consider the type of freight you plan to carry. Different types of cargo require different equipment. For example, if you'll be transporting food, you may require a refrigerated truck or if your cargo is oversized, you may require a flatbed truck. When making your selection, also think about the environmental considerations. The Small Business Matters blog, Greening Your Business Fleet - A Five Step Approach that Can Save You Money, has tips that can help you make an environmentally friendly decision while helping your business's bottom line. Equipment Leasing: Weighing the Pros and Cons provides insight into choosing to purchase or lease equipment for your business. Build up your client base to obtain transportation accounts and contracts. The competitiveness of the trucking industry makes receiving contracts difficult. As a start-up business, you most likely will not have the reputation required to receive large accounts. Many trucking businesses start small, utilizing local contracts and small business trade shows, to build up a client base. As you successfully complete these jobs, you'll be able to grow your business and contract larger jobs.